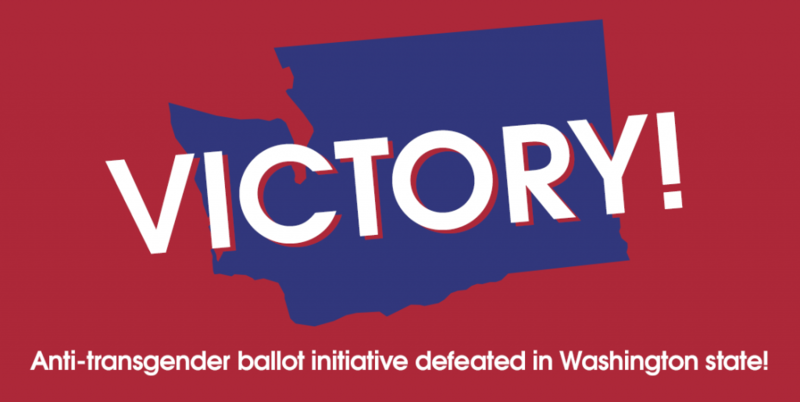 Victory tonight in Washington state, where we’re celebrating the defeat of I-1515 – a harmful proposed ballot initiative that would have repealed the state’s 10-year-old non-discrimination laws ensuring fair and equal treatment of transgender people. Tomorrow was the signature deadline for proponents of the harmful initiative to submit petition signatures to the Secretary of State to qualify for the ballot this fall. And while opponents were scheduled to deliver petitions in Olympia tomorrow morning, they canceled their appointment today – indicating that they fell far short of collecting the 246k+ signatures required to make it on the ballot. Over the last several months, opponents of transgender equality in Washington have peddled the same deceptive scare tactics used to attack and demonize transgender people across the country. But, these anti-transgender tactics suffered a definitive defeat today – thanks in large part to the coalition built by Washington Won’t Discriminate across the state. Transgender people and their families, faith leaders, 150+ businesses, education advocates and more stood together under the simple notion that transgender people deserve to be treated fairly and equally under the law. Freedom for All Americans is a founding partner of Washington Won’t Discriminate, member of the campaign’s executive committee, and has contributed to the coalition in the form of general strategy, communications outreach, digital and field support, and business recruitment.